Throughout the world, tens of millions of people get stitches every year, and researchers have been looking for better options for quite a while. Now, a team of Maryland researchers proposed applying sticky, biodegradable mats of polymer nanofibers onto surgical incisions to seal them and promote healing. 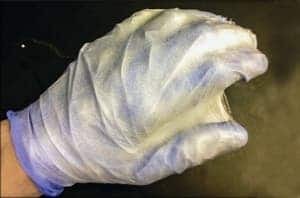 A solution of PLGA nanofibers sprayed from an airbrush forms a mat that conforms to the shape of a surface, such as a gloved hand. This is not a new idea, but the problem is that existing methods of depositing such mats aren’t compatible with living cells and tissues; now, researchers have shown that they can spray a polymer over the wounded area using a simple, common airbrush. These mats of polymer work so fine that they show promise not only in “stitching”, but also as biodegradable, drug-releasing implants or as scaffolds for tissue engineering, says Peter Kofinas, a bioengineer at the University of Maryland, College Park. What they did was create the mats directly on the tissue, using a commercial, common airbrush a tool more commonly used to apply paint. Of course, developing the mat on the site of the wound is no easy feat. They tried many different formulations of a biodegradable polymer until they found a satisfactory result. They finally settled on a variation of poly(lactic-co-glycolic acid) – PGLA. By choosing a particular variation with a specific molecular weight of PGLA and using acetone as a solvent they were able to control the diameter of the resulting fibers – in the end, they settled for mats with fiber diameters of about 370 nm. They tested their mat on pig organs, showing that it can seal diaphragm hernias and cuts to the lung, intestine, and liver in a pig – so we’re not taking about your average cuts here. The acetone evaporates before the fibers are deposited, which means that there are no toxicity problems with the acetone. Cells sprayed with the PLGA nanofibers also show no change in health after 24 hours. In lab tests, the nanofiber mats degraded completely over a 42-day period. “Using an airbrush to deposit biomaterials directly onto tissue is quite enticing and has potential in many areas of medicine,” says Jeffrey M. Karp, a bioengineer and codirector of the Center for Regenerative Therapeutics at Brigham & Women’s Hospital, in Boston. Kofinas’s group is currently doing safety studies and improving the materials for surgical trials in laboratory animals. Wounds are usually closed in several layers. The deep dermal and sub-cuticular stitches are usually doing most of the work anyhow, and the layer we see at the “skin level” is just a backup, if something happens to the stitches. This technology doesn’t eliminate the need for deep closure, it merely complements it. Also, since it will almost certainly be patented, it will come with a big price tag – which means it will be prohibitive in most parts of the world. This isn’t downplaying the researchers’ achievements – it’s just me saying that stitches aren’t going anywhere. This technology, while innovative, will only be applicable to some surgeries, in the more advanced parts of the first country.